Makhdom Javed Hashmi, I become his fan when he wrote a book "Han Main Baghi Hon". Now today every one is discussing about PTI and Makhdom Javed Hashmi, as he joined Imran Khan. Along with Javed Hashmi two other big names are Shah Mehmood Qureshi and Khurshid Mahmud Kasuri this is a big win for Imran Khan. I can't comment about Kasuri and Qureshi people are raising fingers on Imran Khan. But only person who is not under any criticism is Javed Hashmi. How he left Muslim League (N)? 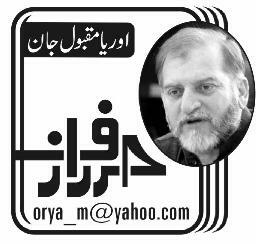 Read this column of Orya Maqbool Jan one the famous columnist in Pakistan. He is famous for his boldness and love for Islam.